Kinetic Arts Center accepts workshop proposals year-round from resident and visiting teaching artists. There is something for everybody at every skill level. Perhaps you need a little inspiration to refine an act you’ve been working on FOREVER. Or, maybe you have been trying to summon the courage to register for one of our classes but you have felt a bit uncertain. Whether beginner or professional, you will find an enriching circus experience at Kinetic Arts Center! Course Description: In this workshop, students will practice moving dynamically with a sense of ease and effortless-ness on the vertical rope. We’ll practice a progression of beats and exercises to generate momentum, and then explore using this momentum to maximum effect, either in flashy power moves or to wrap the rope hands-free. Time allowing, other topics may include: quasi-release moves, building distinctive and clean drops, using body shape to balance on the rope, and some choreographic sequences. Age Range / Prerequisites: Enrollment now open for adults and older/pre-professional teens. 1 year of rope or tissue training, ability to do 4 pull-ups, ability to do 8 bent-arm, or 4 straight-arm straddle-ups. What to Wear: Clothing, free of zippers and buckles, you can move and go upside down in. Instructor Bio: Terry Crane surrendered to restless urges that led him to walk calmly away with the circus at the tender age of 20. With a degree in dance from Oberlin College, his circus journey led him to the San Francisco Circus Center, the Montreal National Circus School, and the Beijing International Acrobatics School. A veteran of the big top and the stage, he has performed in countless countries for various companies, including Teatro Zinzanni, les 7 Doigts de la Main, and Circus Monti. Terry is delighted to share his love of rope technique, circus creation, and collaboration via workshops across the globe. 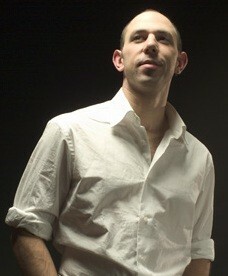 As a director, Terry is on a relentless quest to tell true fictions, contradict human isolation, and portray paradox. Rates: SIGN UP – Only 4 Spots Remain! Course Description: This class examines a series of beats, aka swinging movements on rope, and how they can be applied to create interesting, dynamic choreography. Age Range / Prerequisites: Enrollment now open for adults and older/pre-professional teens. Six months of rope or tissue training, ability to do 2 pull ups, and 4 straddle ups with straight legs. 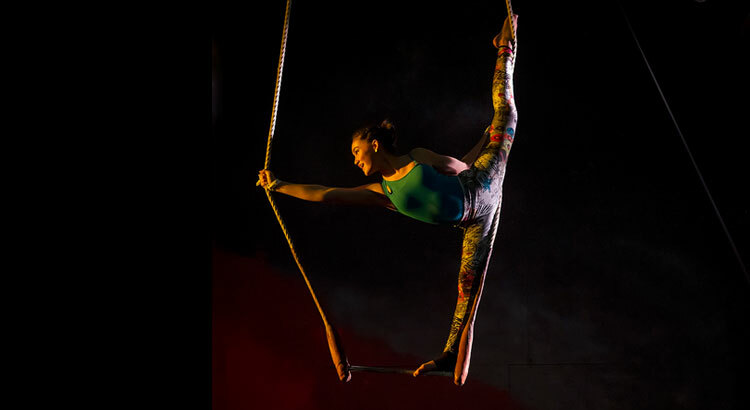 Intro to Tippy Lyra –For low-intermediate through advanced bar aerialists. Discover this fun, challenging apparatus! 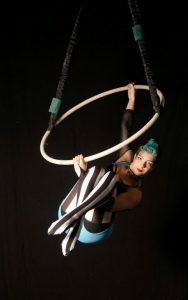 Tippy lyra is a hoop with two tabs directly across the circle from each other, letting the entire apparatus flip 180 degrees and allowing for a whole new vocabulary of flips, tips, and spins. This intro workshop will familiarize students with the unique way this apparatus behaves and will give students an introductory vocabulary. Enrollment now open for adults and older/pre-professional teens with approval. Students should have some intermediate bar experience: in-air inversions (bent arms ok), front and back balances, and pullovers are recommended. Students must be able to hang from bent arms with legs tucked up to chest for 15 secs. What to wear: Wear comfy clothes you can move in. Sable is in love with movement. They began their affair with performing as a teenager practicing street theater and object manipulation, and made it official when they attended the New England Center for Circus Arts as part of the Professional Track Program in 2009. They founded and now co-own Esh Circus Arts, Boston’s premier circus school, and have performed on stages up and down the continent, from intimate experimental shows to big-budget touring circus spectacular. In 2011, they were awarded Best Artistic Performance at the Aerial Acrobatic Arts Festival in Denver, CO. They incorporate their ongoing training as a Feldenkrais practitioner into their body-mechanically-focused teaching style. Sable loves the depth of understanding that comes from teaching movement arts to both professionals and recreational students, and they constantly look forward to the interaction and inspiration that come from working with their students. Dive deep into clowning for 5 days (12 total hours) culminating in a low pressure performance. Participants must be over 18 and willing to take risks, make mistakes and laugh at each other. Wear comfy clothes you can move in. Jaron, International Circus Artist and native to the east bay, has many titles including Clown, Acrobat, Aerialist, Actor, Director, Coach, Master Teacher and Artistic Director. Jaron has been performing professionally for 27 years, a fact that is even more impressive considering he is only 35 years old. He has spent the interim time performing around the world with many companies including Cirque Du Soleil, Make*A*Circus and Flynn Creek Circus. He has made quite a mark in Northern California’s performing arts scene as a Co-founder of both Berkeley’s Impact Theatre and Mendocino’s Flynn Creek Circus. Jaron is known as an accomplished teacher having taught theatre and circus arts all over the bay area at well known schools including Kinetic Arts Center, Clown Conservatory, Circus Center, Cal Shakes and Berkeley Repertory’s Theatre School, Sacramento Theatre Company and Splash Circus just to name a few.